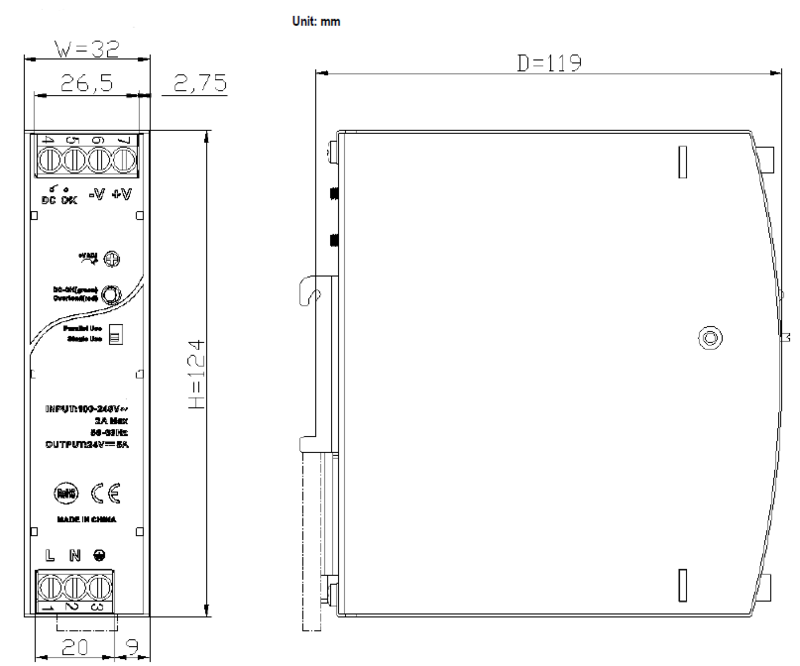 The PSDG-120 series of AC/DC DIN Rail power supply offers 120 watts of output power in a slim 4.69” x 1.26” x 4.88” package. This series consists of single output models with a universal AC input range of 85~264VAC. There are many built-in functions for this series including active PFC, current sharing function, current limiting circuit, and DC OK relay contact. Each model in this series has excellent partial load efficiency as well as over voltage, over load, short circuit, and over temperature protection. This series has UL508, UL60950, and EN60950 safety approvals and has been 100% full load burn-in tested. Please call factory for order details. Notes: 1. Measured at 20MHz of bandwidth by using a 12” twisted pair-wire terminated with a 0.1uF & 10uF parallel capacitor. 2. Power supply is considered as a component which will be installed into final equipment. The final equipment must be re-confirmed that it still meets EMC directives.